Despite the economy making incremental spending on technology difficult in 2009, one bright spot emerged in the 2009 TSIA (formerly SSPA) Member Technology Survey: Web collaboration, with 13% of members having budget for Web collaboration tools in 2009. Since publishing the survey results, TSIA Support Services members have been inquiring: Exactly what is this functionality and how are companies leveraging it for technical support? 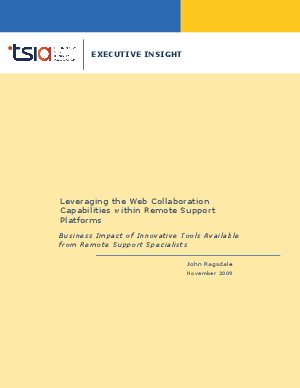 This report provides a functional overview of Web collaboration, including a description of eight distinct Web collaboration modules, their applicability for technical support, and the business case for the functionality. Support management should investigate how Web collaboration can be used to improve service levels, reduce operational costs, provide competitive differentiation, and identify the functional modules worth evaluating for their particular environment.